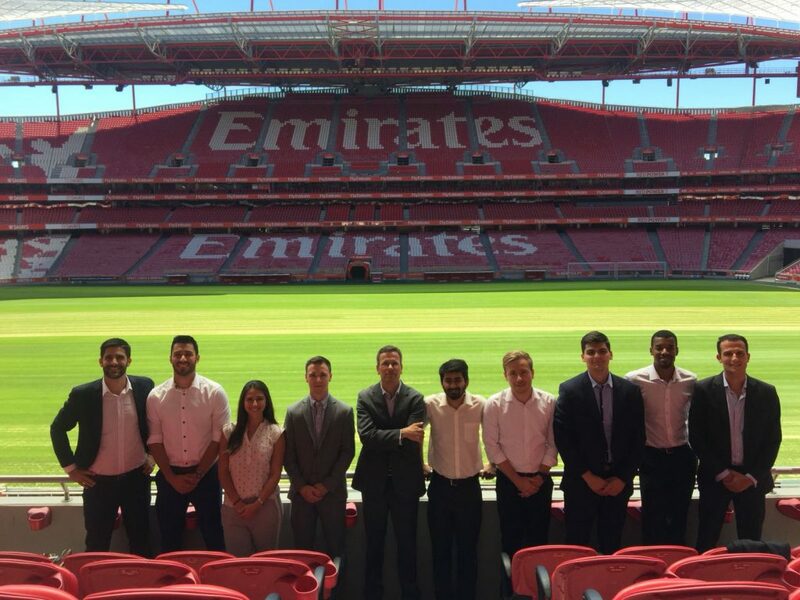 The FBA Candidates went to Lisbon, Portugal to visit one of the partners and members of the FBA family which is also one of the most prestigious clubs in Europe: Benfica. 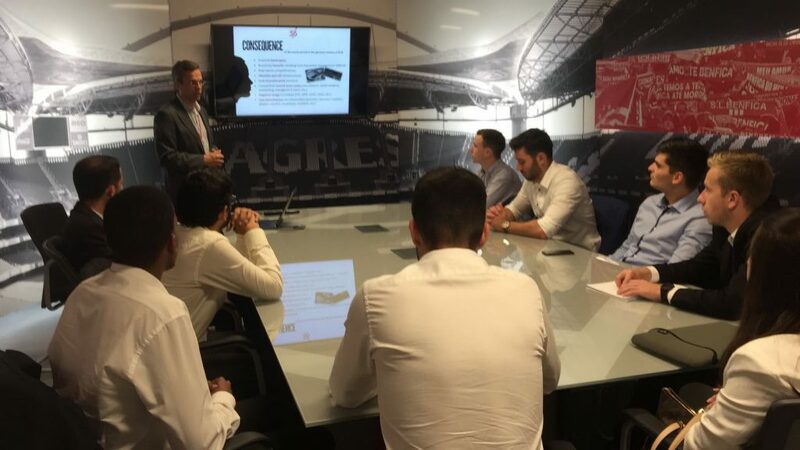 The purpose of this field trip was to understand how a top football club manages its strategy from the management structure to the academy, through innovation and its involvement within its community. The first day began with a presentation of the Portuguese club’s life over the last decades. This insightful presentation allowed the Candidates to understand how the club has gone through its troubled financial and sporting periods in the beginning of the 2000’s until its redemption during the past 15 years which has allowed them to return to the forefront of the national scene and a regular participation in European competitions. One of them was the restructuring of the club through the change of its presidency. This decisive change has led to a real implementation of a vision, mission and strategy that has improved the professionalization of the club at all levels. The second one was the creation of the new stadium “Estádio da Luz” which was also built to host Euro 2004 which took place in Portugal. Having a stadium in accordance of the expectations and criteria of the modern football era is vital for a football club in order to be sustainable. A club like Benfica, which together with Bayern Munich and FC Barcelona is one of the clubs with the highest number of members, benefits of a huge fan base willing to go to the stadium supporting their favorite football club. Benfica is very popular so it is essential for them to have a venue expressing the values, the symbols and the colors of the club and being recognizable and recognized by its community. The third action is the set-up of the Academy better known as the “Caixa Futebol Campus”. This strategy is one of the epicenters of the club both from a sporting and financial point of view. Indeed, having one of the most successful academies in terms of youth development demonstrates the strategy and long-term vision of a club which is aware of the fact that seeking to compete in terms of players transfers with larger clubs is not sustainable in the long term and does not allow them to develop the club in an effective and structured way. Coaching and developing the talents and future stars of tomorrow allows them to make great revenues in terms of transfers when the top clubs want to acquire one of their talents. Players like Ederson, Bernardo Silva, Renato Sanches, David Luiz and Andre Gomes to name just a few have all gone through Benfica and allowed the club to generate substantial revenues. The day continued with the tour of the fabulous Benfica stadium “Estádio da Luz”. Before entering this modern stadium, the historical weight of the club is felt with the statue of one of the greatest football players of all time having played in Benfica, the famous “black panther” Eusebio who seems to protect the stadium. Once inside the stadium reception two other statues bring attention in different ways: The happier one illustrates the only coach to have won two Champions League trophies with the club, Béla Guttmann, proudly wearing the two trophies won against Real Madrid and FC Barcelona. The other sadder and more tragic statue was made in memory and in honor of Miklós Feher who tragically died of a heart attack during a match on January 25th in 2004. The history of Benfica is made of happier periods and others more sad and complicated but all are addressed and have shaped the club as it is and legitimizes the own identity of the Lisbon club. Once in the stadium one of the first things we can notice is the signature of the Populous architects who designed this place. Indeed its design is similar to Arsenal’s “Emirates Stadium” (or the other way around) which makes it very familiar to Gunners fans. During this tour we also saw that we were not alone and that the stadium is regularly visited by local fans as well as fans and tourists from all over the world wanting to know more about the club and its history. One of the club’s historical symbols is its eagle which we can see on their crest. At every home game the tradition is that the eagle is released and flies inside the stadium. This shows how important it is for a club to show its values ​​and symbols in order to stand out and be identifiable from others and Benfica does it very well. The museum itself is just outside the stadium. For a club, a museum is one of the best ways to tell their story through its origins, its trophies, and the players and coaches who made the club what it is today. However, the club’s story is not just about football. Indeed, Sport Lisboa e Benfica, which is the full name of the club, is actually a multisport club with sections in disciplines such as futsal, basketball, handball and hockey. This makes the museum even more impressive in terms of trophies with its incredible amount of cups won at different tournaments. All of this gives even more amplitude to this perfume of excellence and success that the club demonstrates. What we can also feel in this museum is the importance of Eusebio and the players who participated in making Benfica famous, such as Rui Costa or Nuno Gomes. The coaches are also honored with a wall retracing all the tacticians who trained the red and white team such as Béla Guttmann mentioned above, Sven-Göran Eriksson or Jorge Jesus. Leaving the museum, the feeling which remains is that of having learned more from a club attached to its traditions, its community and its history. The second day allowed us to get acquainted with the impressive youth academy of the club that is located in Seixal. The “Caixa Futebol Campus” is a magnificent center and model of its kind with its state-of-the-art gyms and facilities. As the club wants to continue its development, the current nine football pitches will soon be increased in order to expand the number and level of its young talents who come from Lisbon, throughout Portugal and other places around the world. Visiting this campus makes it easy to understand why so many talents are coming out, as the club also seeks to educate its young talents at the academic level. This approach of an academy built for excellence allows their players to be able to adapt in different countries tactically, physically and technically speaking. The club, through its youth coaches and use of technology, are constantly seeking to improve and serve the level of performance of its athletes. The 360S simulator for example gives them the opportunity to join technology and coaching into a single entity. This innovative training system allows them to work on the specific aspects of the different positions of the players (goalkeeper, defender, midfielder, forward) such as reflexes and speed of execution among others. The visit of this academy perfectly shows the will of the club to provide acts to its words with a training center that allows to develop the own / intrinsic level of its young players but also to educate them at the academic level; two principles that are important to Benfica. Our stay in Lisbon ended with the presentation of the association “CAIS” which we had the opportunity to visit. This association is a member of streetfootballworld and through the impact that football arouses, CAIS seeks to promote the social integration of the country’s poorest and those suffering from social exclusion. This presentation and explanation of how football is used as a vector of social inclusion allowed us to see how powerful sport is in helping people to come together and take control of their lives because it gives meaning to their daily life. Indeed, through CAIS, an official Portuguese football team was able to participate in their own World Cup, which also took place in Russia during the FIFA Foundation Festival 2018. The aim of this tournament is to strengthen social development and promote cultural exchange between the different participants. Different associations from all the continents of the world were able to compete in fair play during this football tournament that celebrates community life. It was interesting to see this other side of football that is not necessarily rightly or wrongly linked to the clichés of a football disconnected from realities. 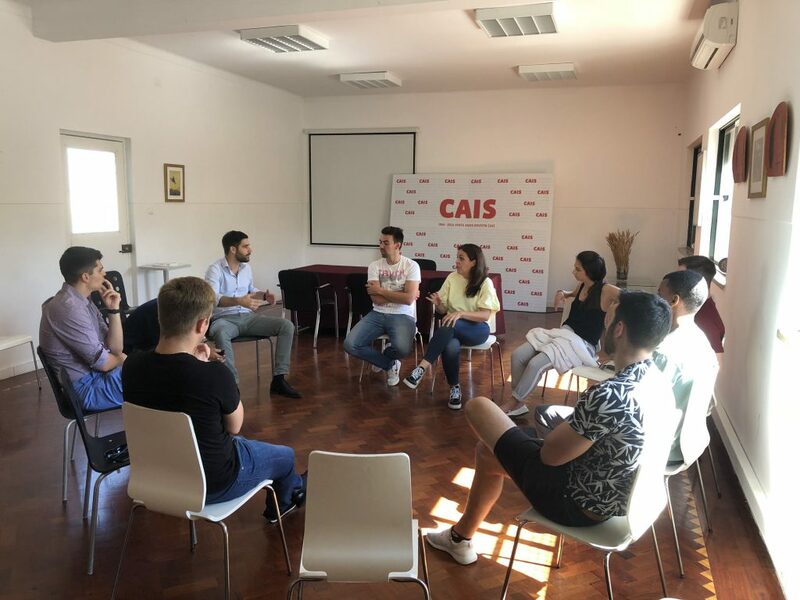 Discussing football’s social impact with the CAIS association staff members Joana Vilela and Nuno Rodrigues. This last visit echoed in me as different pointers regarding the power of football and its community. If we take the example of Benfica, the good understanding of its own situation in the football ecosystem allowed them to set up a strategy to develop and train the stars of tomorrow in order to compete in their own way against other European football clubs who are on a different level financially because of . 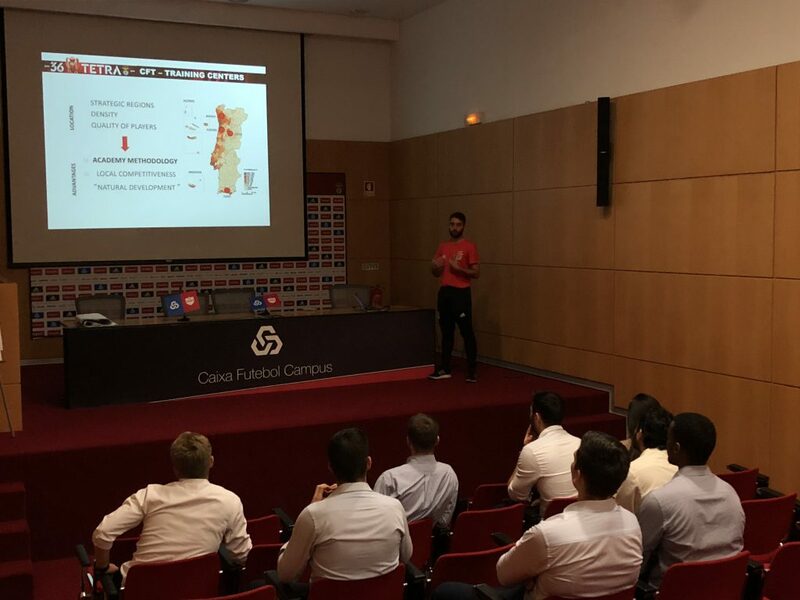 The promotion of Portugal and its regions through its talents and local coaches allows the club to be an example in terms of academy, innovation and development of players. And if we look at the social impact of football, the community is also the first concerned and to be taken into consideration. By targeting the different problems in a community, it is possible to achieve great improvement through sport in combination with programs and workshops aimed at reintegrating or including the most disadvantaged to return to society. All this concrete and practical knowledge allowed the FBA Candidates to realize the impact of a club and the need for a clear strategy and its implementation. Understanding the social issues around football and how the same sport can influence and change it allows Candidates to gain additional experience that will be useful for their future career in the football industry. Maxime Kalimba is a Candidate of The FBA’s Professional Master in Football Business, expected to graduate in August 2018. He can be contacted via LinkedIn.